The wife of William H. Rehnquist, Chief Justice of the United States Supreme Court. Chief Justice Rehnquist died on 3 September 2005 and will be laid to rest with Mrs. Rehnquist in Arlington National Cemetery. 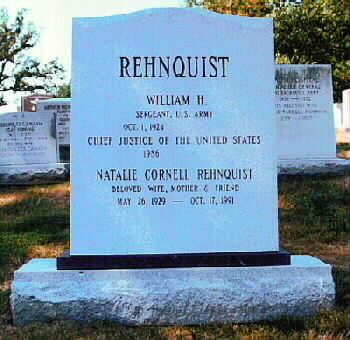 "Natalie C. Rehnquist died on October 17, 1991 after a long struggle with ovarian cancer. She was 62 and died at the National Institutes of Health said Supreme Court spokesperson Toni House. "A native of San Diego, California, she graduated from Stanford University in 1951. She met her husband while at Stanford. They were engaged while she was a Central Intelligence Agency employee and he was a Supreme Court Clerk in the early 1950s. They were married on August 29, 1953. She served as Director of Volunteer Services, National Lutheran Home for the Aged from 1972 to 1980 and president of the Home Auxiliary from 1985 to 1987. While in Phoenix, Arizona, where her husband practiced law from 1953 to 1969, she was active in the Junior League. "Her funeral was held at the Emmanuel Lutheran Church in Bethesda, Maryland on October 22, 1991, with burial thereafter in Arlington National Cemetery."